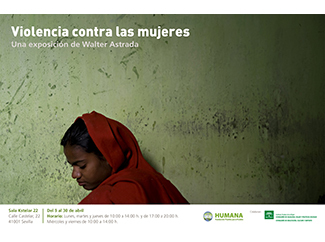 Thursday April, 9 at 11 am takes place in Seville the official opening of the 'Violence against women' photographic exhibition of photojournalist Walter Astrada. This exhibition, which collaborates the Andalusian Institute for Women and the Education, Culture and Sport Department of the Junta de Andalucía, will run until April 30 in Room Kstelar 22. Hours are Monday, Tuesday and Thursday 10 to 14 hours and 17-20 hours, Wednesday and Friday from 10-14 hours. To mark the opening of the expo is expected a small ceremony with the participation Carmen Cuello Pérez, Director of the Andalusian Institute of Women, Francisco Diaz Morillo, provincial delegate of the Education, Culture and Sports Department and Astrada, winner three-time World Press Photo.